When I was asked if I would like to review Prym’s new Ergonomics knitting needles, I immediately said yes. Partly because my friend Sarah from Crafts from the Cwtch told me how brilliant they were and partly because I have been searching for my knitting-needle soulmate for the last 8 years! I learned to knit when I was seven (English style), and since then, knitting and I have had a love/hate relationship. It was only last year when I started knitting my first socks that I realized why the relationship was so tempestuous: tension. I knit way too tightly. Since then, I have been actively trying to loosen my tension while learning to knit Continental style at the same time. This Continental adventure was not going well at all. I kept either splitting my yarn or dropping stitches. 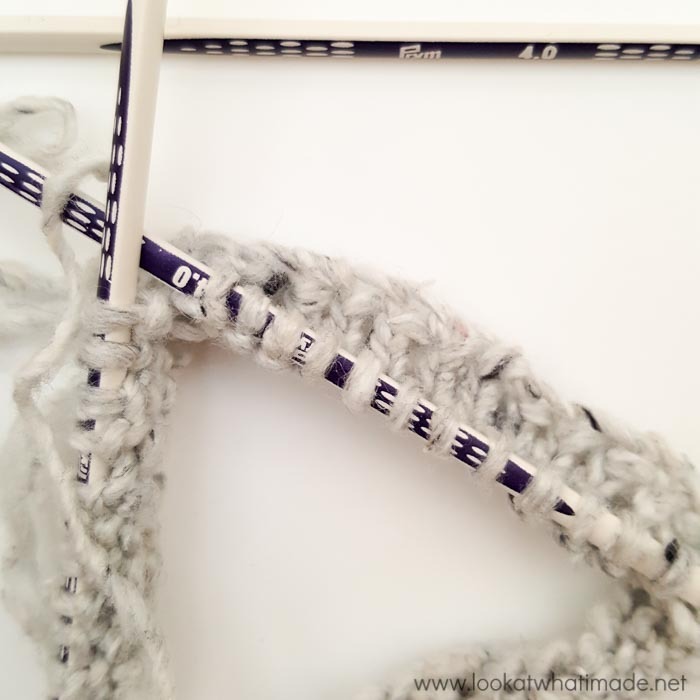 When I got my hands on the Prym Ergonomics knitting needles, everything changed! No dropping stitches, no splitting the yarn, and much better tension. I cannot tell you what a difference it has made to my relationship with knitting. Before I start waxing lyrical about the needles, let me tell you a little bit about them. 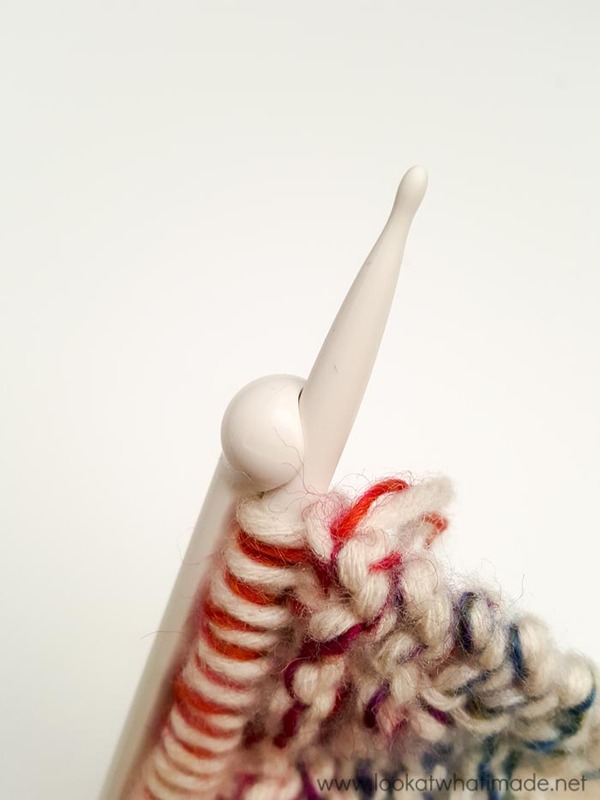 Prym has ‘gone back to the drawing board’ to reinvent the knitting needle. If you have a look at the promotional video below, you will see why I was so excited to try them! For my review, I received a set of 6 mm single-pointed needles (35 cm long) and a set of 4 mm double-pointed needles (20cm long). When the needles arrived, I immediately tore the package open and grabbed the one pattern I have been dying to make since I first saw it. Unfortunately, the pattern calls for 4.5 mm circular needles, which didn’t match either of the sizes (or types) I was asked to review. I gave it a go anyway, figuring that this could be a ‘practice run’. Made from high-performance synthetic material, the needles are light-weight, smooth, and warm to the touch. They are very flexible (I don’t know exactly how flexible because I didn’t want to flex them much more than I did in the photo below. This flexibility makes them extremely comfortable to hold as they conform to your palm’s natural curve when holding a needle. The middle of the shaft is triangular (hard to show on photographs). 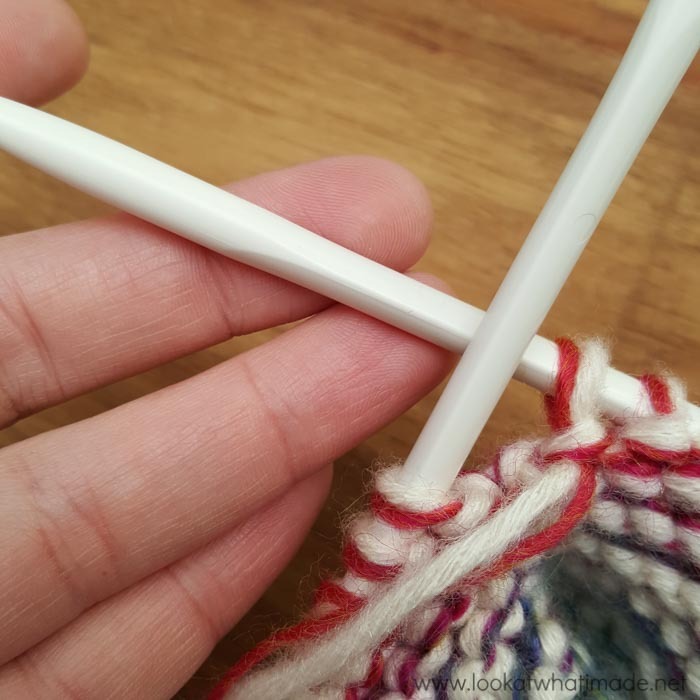 It is comfortable to grip and slightly smaller than the rounded part near the end, which means that your stitches ‘slide along’ much easier over this part. This also means that your stitches are less likely to slide off the needle, due to the fatter round portion between the triangular shaft and the point. The tapered portion is longer than I am used to, which means that you have to push each stitch farther up the needle to maintain gauge. 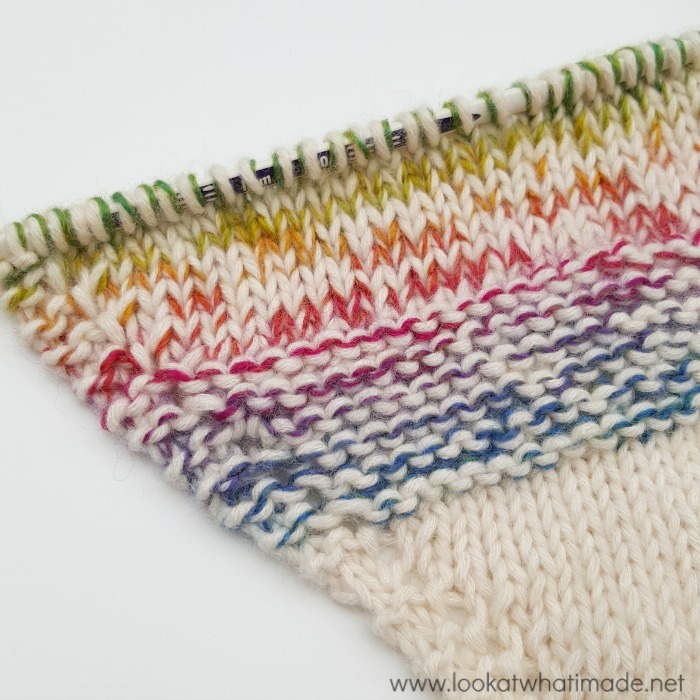 It took me a while to get into the rhythm of sliding my stitches that far, but once I got used to it, I actually found that the ‘sliding action’ made it much easier for me to keep my tension more relaxed, and improved my speed. It’s as if something finally clicked, and my knitting went from separate choppy actions to a fluid undulating motion. The ‘hook tips’ are my favourite feature! I just cannot believe that no-one has thought of this before now. It makes such perfect sense! 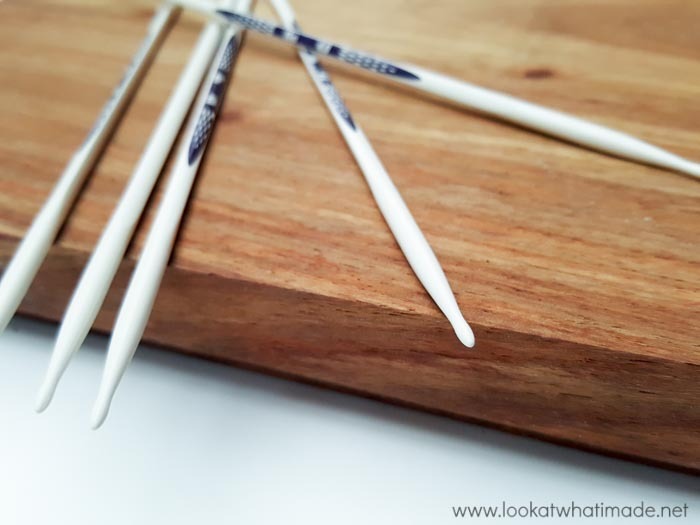 Instead of having a stabby pointy point, these needles have a rounded point that narrows slightly before it tapers into the rounded gauge-determining part. 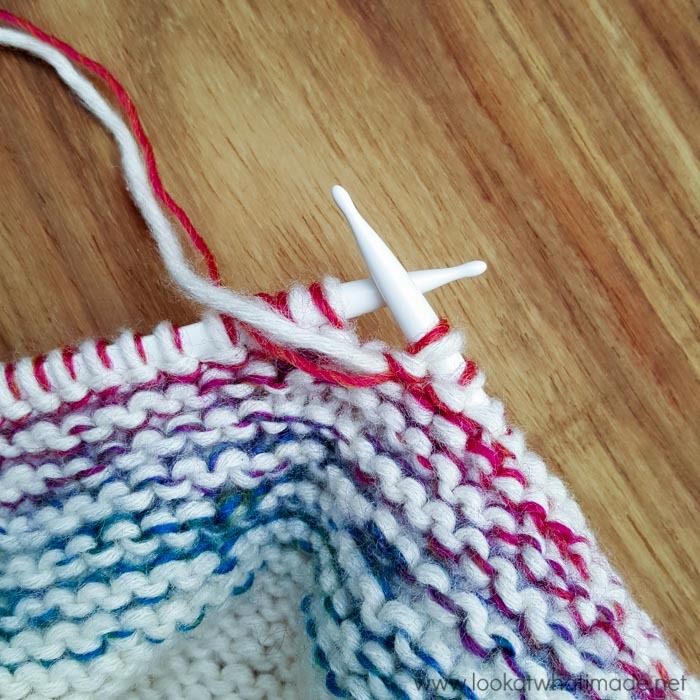 When picking (or throwing) your stitches, this rounded point means that you don’t have to apply as much tension to your working yarn when scooping it through the stitch on your needle. This, in combination with the sliding action I have finally mastered, has made the biggest difference to my tension (for the better). The single-pointed needles also have ‘click heads’. And right here is where your eyes should light up (even more)! 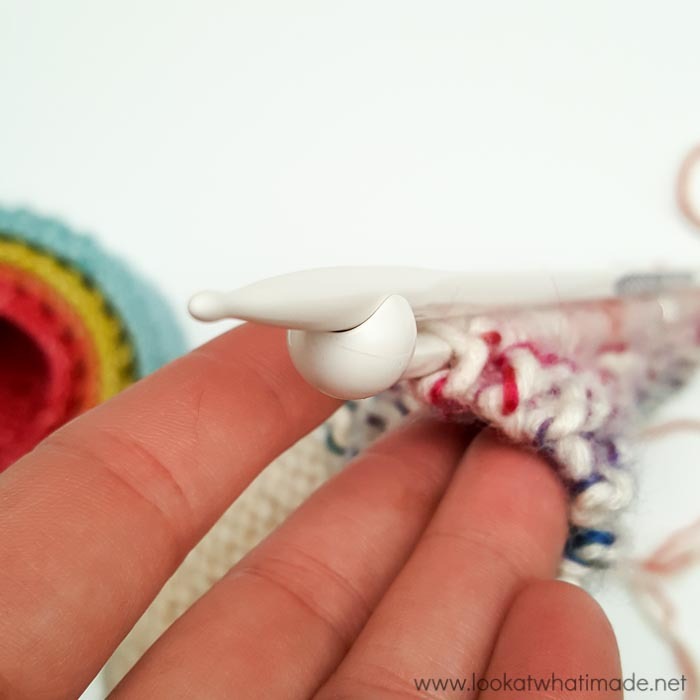 The ‘click heads’ are shaped in such a way that you can ‘click’ your needles together when you are not working (provided you are not in the middle of a row). 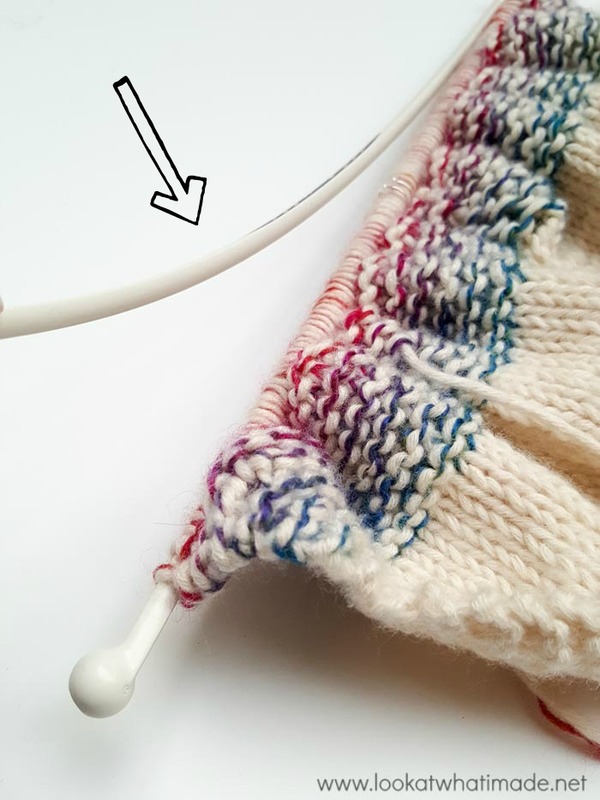 This means that you can chuck your knitting into your bag for a bit of on-the-go knitting without having to worry about stitches accidentally making their way off your needle. These needles are also very quiet. At most, you will hear a slight rustle as you pick and slide, pick and slide… I am not a fast enough knitter to have ever been shushed or given the evil eye due to clicking, but my granny… she knits with a fierce intensity, and my childhood was punctuated with the clicking of her needles as she sat knitting at her kitchen table. Originally, I had cast on using the Secret Garden yarn (a silk/cotton/polyester mix) required for the pattern. I found that the needles ‘gripped’ the yarn, and my tension was tighter than it had ever been, so I decided to switch to the smoother Stonewashed XL (a cotton/acrylic mix) pictured in this review. Once my gauge and speed had stabilized, I introduced a strand of Invicta Colour ( a polyamide/wool mix) for a bit of ‘oomph’. I thought this would make the needles grip the yarn more again, but it didn’t, so when I cast on with the double-pointed needles, I decided to give the Secret Garden another go. This time, I experienced very little resistance, so I suspect the ‘grippiness’ had as much to do with tension as it did with the yarn/needle combination. Although the double-pointed needles are longer than any I have used before, I found them very easy to use. Sliding the stitches onto the triangular part of the shaft when changing needles meant that I did not have to worry about the needles worrying their way out of the stitches as I worked (the ‘fatter’ rounded part near the ends acts as a natural resistance). I also found that sliding them to the triangular part before starting on the next set of stitches made my ‘ladder’ much less visible. This is due to the fact that the circumference of the triangular part is smaller than that of the round part, so tensioning over this part means that there is less give between the last stitch made and the first stitch made on the new DPN. The sizing information for the needles is printed (not embossed). I know from working with the Prym Ergonomics crochet hooks that this printing will eventually be worn away as you work. Luckily, it is easy enough to determine needle gauge using a standard needle gauge tool. 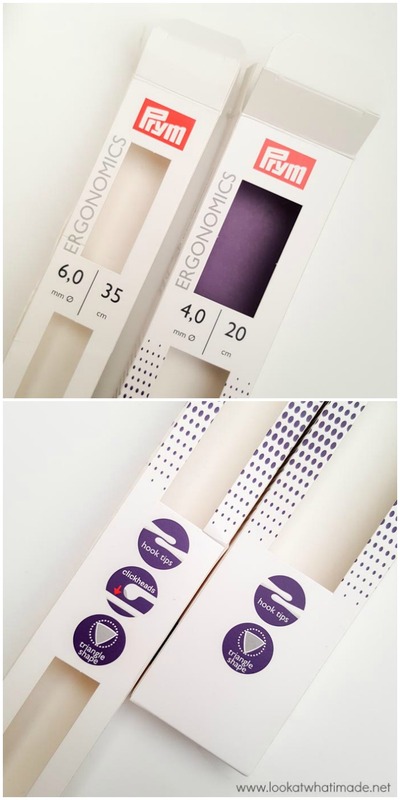 The Single-pointed needles and are available in gauges 3.0 to 10.0 in 35 cm length, and 3.0 to 12.0 in 40 cm length. The double-pointed needles are available in gauges 3.0 to 8.0 in 20 cm length. I can’t wait to get my hands on the circular needles (available in the Summer). The cables will be plastic-covered steel, which should make for less twisting than I have experienced with other brands. You can use Prym’s Store Finder to locate your nearest stockist. 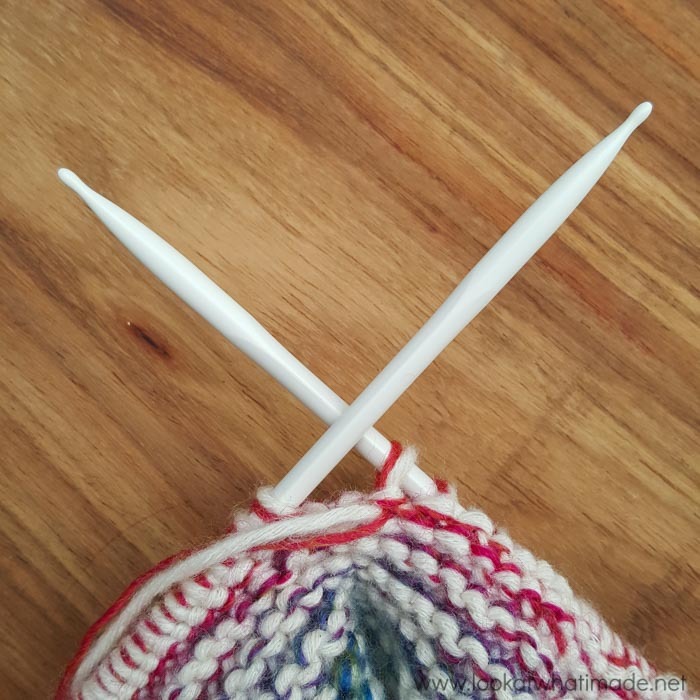 So, have I now found my knitting needle soul-mate? I think I just might have! 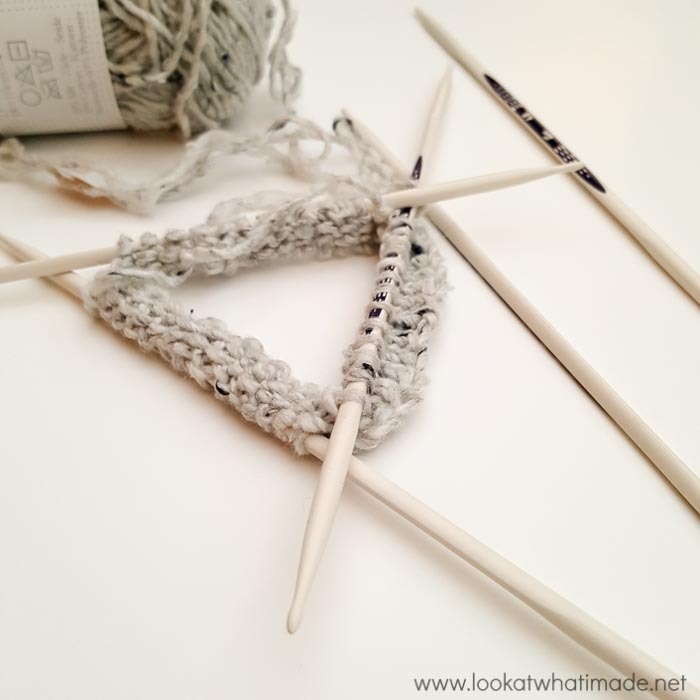 I am curious to know if any of you have tried these knitting needles and what you thought. *This post was sponsored by VIRAL LAB. All opinions are my own and completely honest. I never endorse products I wouldn’t buy or use myself. I was lucky enough to test these ergonomic needles, size 5. They are a pleasure to use, the triangular shape took a moment to get used to, but after a few minutes I was happily knitting away. I had not long before invested in a set of wooden Knit-pro’s, I ‘m very happy with them but hadn’ t I bought them I would have bought the Prym ergonomics. The click part is amazing. Why didn’t anyone think that up before? I know! But sometimes things are so obvious that everyone misses them. Would LOVE to see these sold here in the US. Please ask them if they plan on making the hop across the “big lake” anytime soon. I’m have the same tension issue with my continental stitch. i went on line looking for the needles but they are only in Europe and England at this time. I would really like to see if i can order them from a store if they will ship to the USA. The Clover Crochet hooks made a difference in how i hold my hook so maybe these will make a difference for knitting. Thank you for the info!! we currently focus on the European market. Due to a high demand also by users from other countries we are evaluating our options to sell the needles in the USA. Please be patient, this will still take some time. 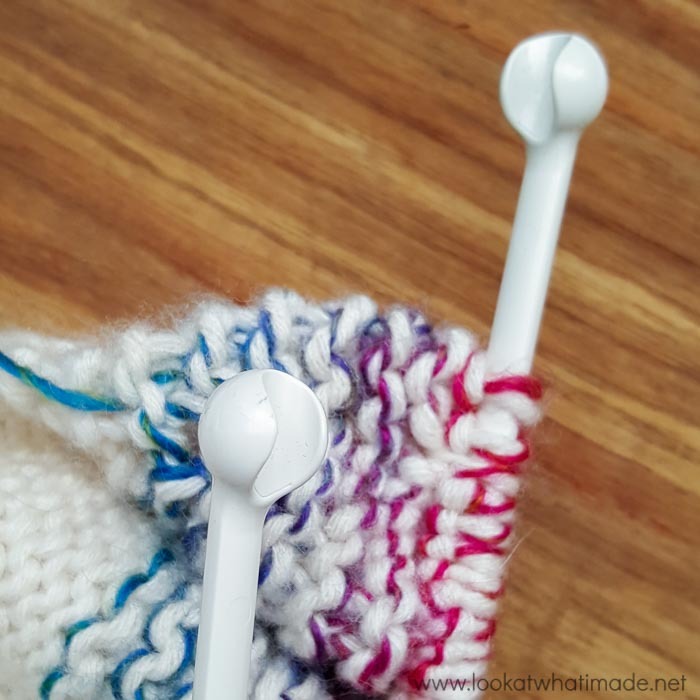 Hi, would just like to find out whether the Prym Ergonomic knitting needles are available in S A, and where I can find some. I am in KZN. Hi Gail. They are not available in South Africa yet. As soon as they are, I will amend my post to include a link. we currently focus on the European market. Due to high demand we are evaluating out options for the gloable market as well, but it still takes some time. For further information you can also use our storefinde on our microsite https://storefinder.prym-ergonomics.com/en/ to search for stores offering the needles. I don’t knit and these have me all sorts of curious =) The hook end is what calls to me. The hook end is brilliant! 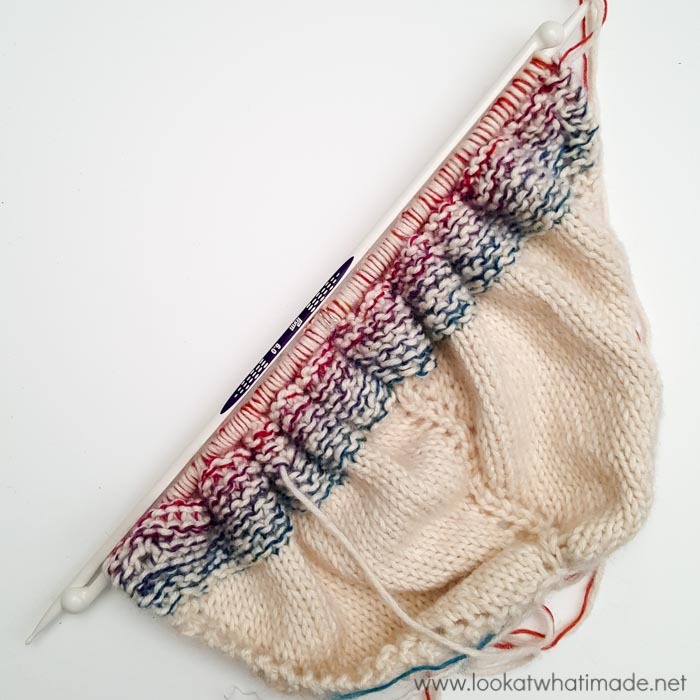 Love it that you’ve found your knitting soulmates – i’m too much in love with my ChiaoGoos to cheat on them though – project looks very interesting!! They look well worth trying. I will look out for the circular needles introduction. they don’t seel these needles and hooks in USA. I am sorry to tell you that we are currently focusing on the European market. Due to a high demand we are evaluating our options to launch the needles in the USA. Please be patient, this will still take some time.